Jerome, founded in 1883 was once a booming copper mining town. In 1903, brothels, casinos and general vice earned Jerome the dubious distinction of “The wickedest town in the west.” By 1938, the mines had played out and Jerome became a ghost town. In the 1980’s an interesting collection of hippies, bikers and artists reclaimed the town and over the past few decades it has become a cool tourist “ghost” town. The road to Jerome has treacherous switchbacks that climb Mingus Mountain, but the destination is WELL worth the 45 minute drive from Lo Lo Mai. One of the 7 natural wonders of the world, the Grand Canyon is a scenic 2½ hour drive from Lo Lo Mai. Many of our guests pop up for the day to check out the big ditch. This steep sided canyon carved by the Colorado River, it is 277 miles long, up to 18 miles wide and attains a depth of over a mile (6,093 feet or 1,857 meters). Nearly two billion years of Earth's geological history have been exposed as the Colorado River and its tributaries cut their channels through layer after layer of rock. For thousands of years, the area has been continuously inhabited by Native Americans, who built settlements within the canyon and its many caves. Northern Arizona is home to many incredible Indian ruins. On the saddle peak across from Lo Lo Mai rests an unrestored Sinagua ruin. More famous restored ruins can be enjoyed just minutes from Lo Lo Mai. Wupatki National Monument is located approximately 30 miles north of Flagstaff, AZ in the picturesque high desert region just west of the Little Colorado River and the Navajo Indian Reservation. Visitors and vacationers to Wupatki can explore the ruins of the pueblos, examine unique flora that flourishes in the area, walk among the trails used by early agriculturists and experience what life must have been like for these ancient natives almost a thousand years ago. The word "Sinagua" is a contraction of the Spanish words "sin agua," or, "without water," an allusion to the arid country in which the tradition arose. The Sinagua were a group who lived in the Southwest between the 6th and the 15th centuries. The Sinagua people, who may have emerged from Yuman origins, occupied the region which encompasses the ponderosa and pinyon/juniper forests and the grasslands and desert scrub country from the vicinity of Arizona’s Sunset Crater volcano southwestward to the state’s Verde River. Be sure to stop by and check this old piece of Arizona history. Did we mention its a little bit spooky? On December 8, 1906, President Theodore Roosevelt celebrated the passage of the Antiquities Act by declaring four sites of historic and cultural significance as our nation's first National Monuments. Among these was Montezuma Castle, which the President identified as a place "of the greatest ethnological value and scientific interest." Montezuma Castle National Monument quickly became a destination for America's first car-bound tourists. 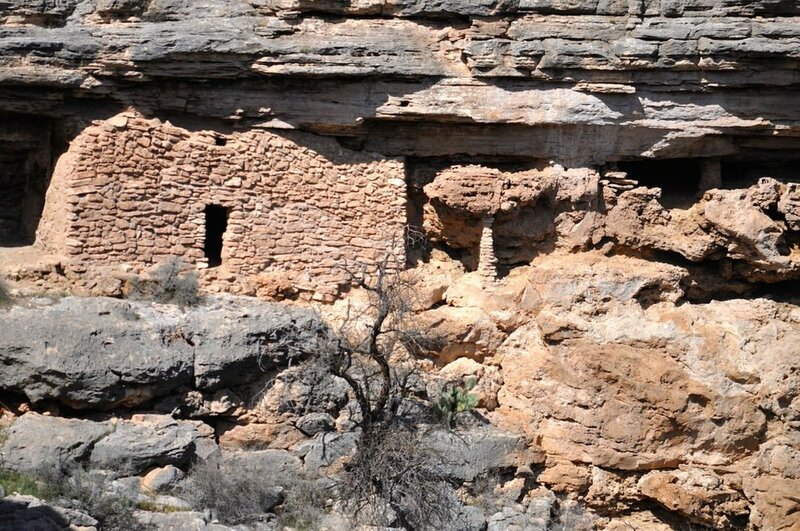 In 1933, "Castle A", a 45-50 room, pueblo ruin was excavated, uncovering a wealth of artifacts and greatly enhanced our understanding of the Sinagua people who inhabited this riparian "oasis" along Beaver Creek for over 400 years. Both monuments are within an easy 30 minute drive of Lo Lo Mai.